MIAMI BEACH, Fla. — From rooftop bars and rope lines to gridlocked streets and sidewalks, Ocean Drive, the once-idyllic neon heartbeat of South Beach, can trample the senses on most weekends. Tourists sip Technicolor cocktails from fishbowl-size glasses. High-decibel music throbs into the night as people amble along in the glow of stadium-style lights. A weed dealer in the shadows peddles “Purple Haze” for $25 as a near-toothless older man chases women with a seven-foot Burmese python draped around his neck. Police officers are everywhere, scanning the action. After years of complaints from residents and a steady stream of online criticism from tourists, the City of Miami Beach moved recently to try to tame the epicenter of the mayhem on Ocean Drive, the former gleaming gem of the area’s Art Deco 1990s revival. It was the latest test for a city that has long grappled with how to balance the desires of raucous partygoers with the demands of more sedate visiting families and fed-up residents, many of them wealthy. 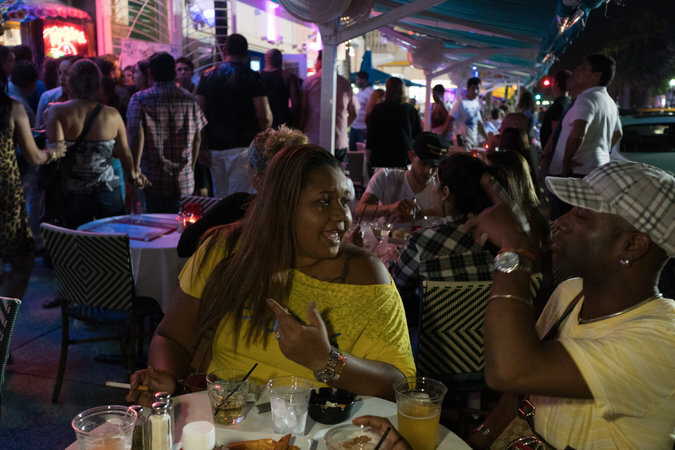 For Ricky Arriola, a Miami Beach commissioner who is spearheading the crackdown on clutter, noise and crime, the bacchanal along Ocean Drive lurched long ago toward becoming Bourbon Street. A modicum of grown-up sobriety was called for, he said. Two murders this year, including the October shooting death of Lavon Walker, a Brooklyn anti-violence activist, brought renewed attention to crime in the area. And the drip of negative Trip Advisor and Yelpreviews describing Ocean Drive as “tacky,” “seedy,” “rough,” “overpriced” and teeming with homeless people has not helped. Mr. Arriola, elected commissioner last year, was unsparing in his assessment, saying many cafes are competing in a “race to the bottom” and trying to “prey on tourists” with bait-and-switch schemes and other scams. Sidewalks are so cluttered with tables and mammoth umbrellas that “it’s unattractive, unsafe and a breeding ground for crime,” he said. Each business has dueling, high-decibel soundtracks blasting from “speakers mounted outside, just pumping noise in the street,” he added. And traffic is often at a standstill. The City Commission is gradually tackling these problems, issue by issue. Noise is being curtailed — now only restaurants and bars, not shops, can blast music outdoors — and there are plans to beautify the street. Smaller umbrellas that don’t completely block the Art Deco architecture have been rolled out, and fewer tables crowd the sidewalks. Restaurants will face much steeper fines on aggressive solicitation. Cafes bent on scamming are being closely monitored, and city officials hope to institute a cap on the number of downscale chains on the strip. 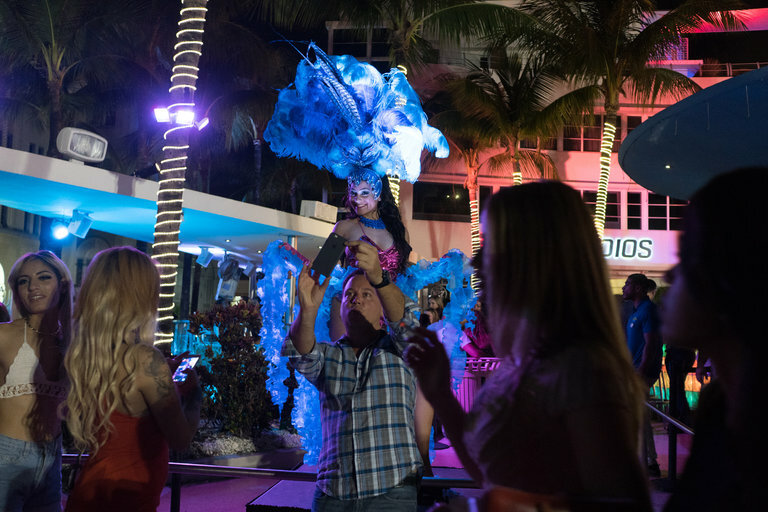 Jessica Robinson, who sat outside Mango’s Tropical Café, where women in feathers performed in a Latin cabaret show atop a small stage, said she lived a few blocks away and usually avoided Ocean Drive. She came on a recent weekend with her Brazilian father, who was in town. Upset for years now, Mr. Novick started posting clips of the crassness on his YouTube channel, I Love Miami Beach, and Facebook page, South Beach Sludge Report. Mayor Philip Levine says he has heard it all before. Last year, he tried to move last call to 2 a.m., from 5 a.m., which panicked owners of restaurants and businesses on the strip. A compromise emerged: The city steered more money to the Miami Beach Police Department, which added 12 police officers to the area. The officers sit under towering lights that span the most problematic three blocks of Ocean Drive, from Eighth Street to 11th Street, making them hard to miss. A strategy to help the homeless in the area is also now in place. The police chief, Daniel J. Oates, said that crime in the area had dropped but that a couple of highly visible murders made the problem seem worse than it was. Ocean Drive is usually at one end or the other of a boom-and-bust cycle. For decades up until the late 1980s, it became a favored spot for middle-class retirees and those on fixed incomes; they gossiped as they sat on plastic chairs on the hotels’ front porches and looked at the ocean. Then the hotels fell into disrepair. After the 1980 Mariel boatlift — an exodus of 125,000 Cubans to Florida — many of the criminals whom Fidel Castro had released from prison and sent to Miami flocked to the neighborhood, and crime spiked. In the late 1980s, after preservationists saved a number of buildings from demolition and fought to create a preservation district, the neighborhood made a flashy comeback that attracted celebrities. Gloria Estefan invested in a hotel on Ocean Drive and a restaurant. Gianni Versace moved into his over-the-top mansion at 1116 Ocean Drive (and was gunned down on its steps in 1997 by a serial killer). Television shows like “Miami Vice” couldn’t resist the natural light, the beach, the sky and the architecture. High-fashion models flocked here. Carefree from the start, the scene was louche, and its seedy nature was seen as a key ingredient of its cool charm. Beyond the hard-core three-block party scene, some restaurants and hotels, like the Betsy, cater to a more upscale crowd. Mr. Novick said he feared the city’s plan of action was a “fundamentally flawed” parade of half-measures that would ultimately fail. In his view, the chaos is a byproduct of too much binge drinking in the wee hours, which is why he believes last call should be moved to 2 a.m.
At the Clevelander, which features Vegas-style dancers on its roof and amped-up music, Tiffany Chalothorn, 26, an actress from New York, sipped tequila with two friends. She had no complaints, she said: The weather was balmy, music by Pitbull was beckoning on the dance floor, and the scene seemed far from threatening.